Back to School Math Mats - Free Addition and Subtraction Printables! Summer is coming to an end and back to school season is in full swing! 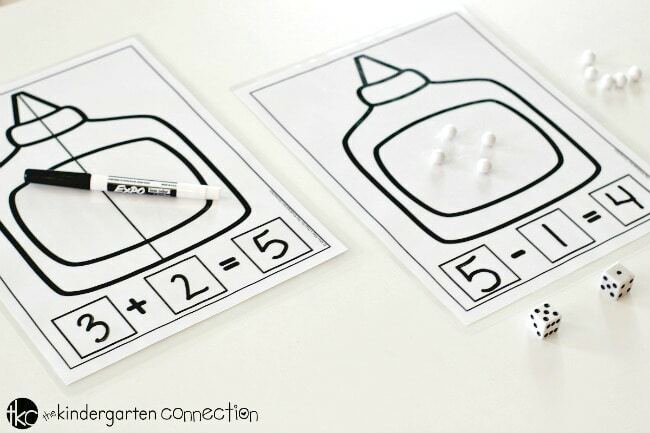 Up next in our math mats printable series are these glue bottle Back to School Math Mats! 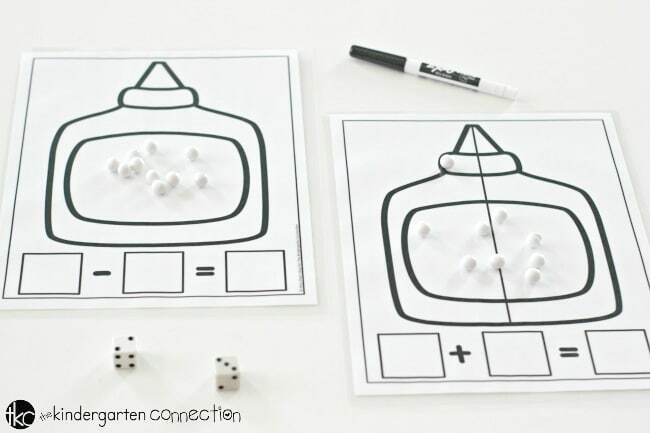 They are the perfect way to get students excited about adding and subtracting! 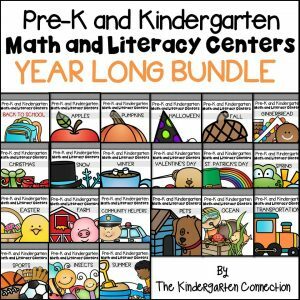 Pair this with our Roll and Color Math Games for the Year! 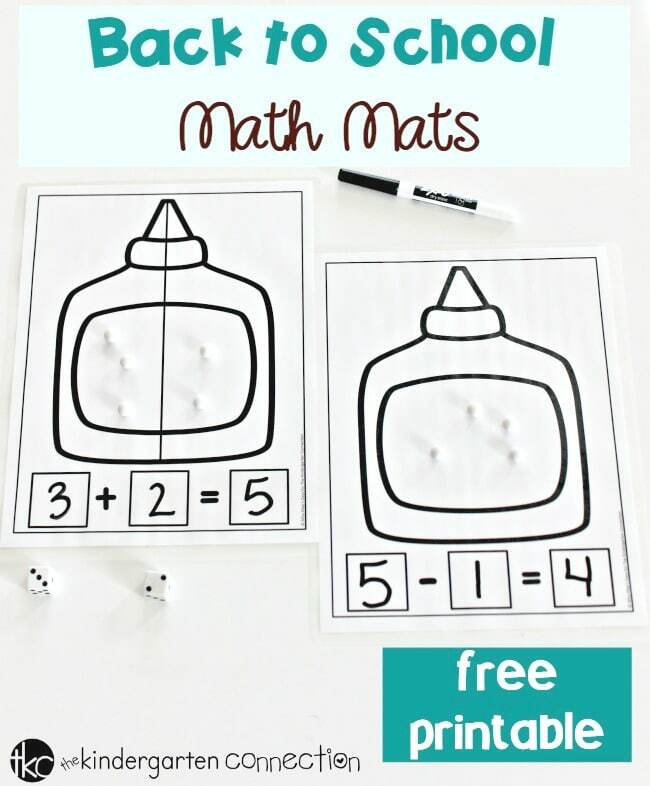 Your students are going to love these glue bottle addition and subtraction math mats! 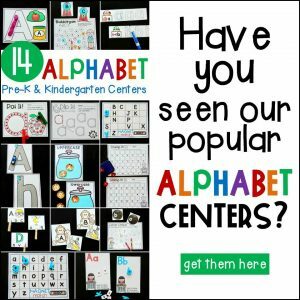 These math mats are suitable for kindergarten and 1st grade. 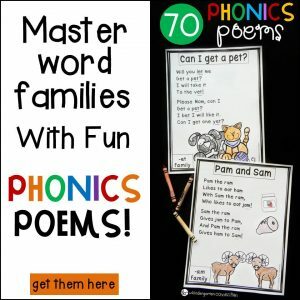 You can use them in your homeschool or traditional classroom. I like to put them in my math center. 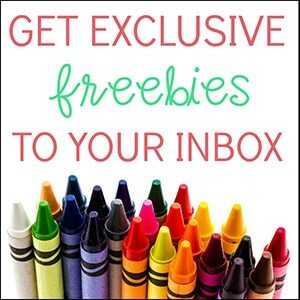 You could also use them in small groups or send them home for students to use at home for extra practice. Let’s gather supplies and get started! I like to laminate my math mats for use year after year. 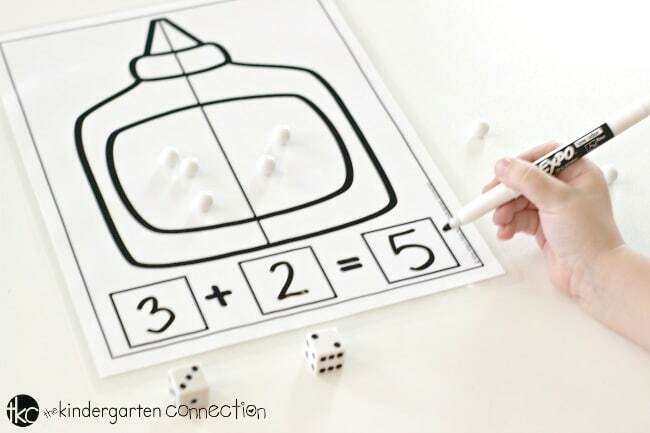 It also makes this activity more effective when children can use dry erase markers to write in the math equations. 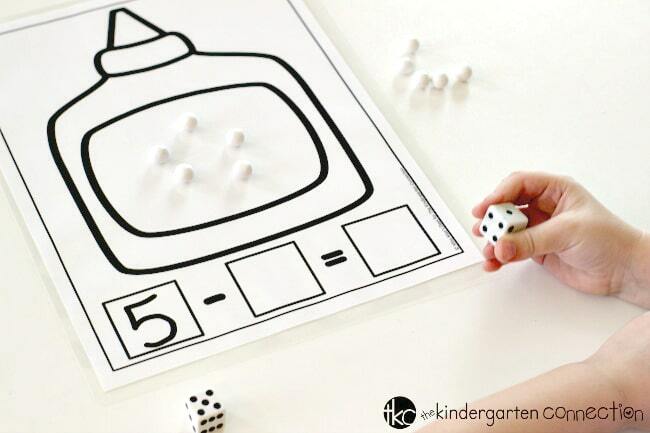 Students will start by rolling 2 dice (or one die, twice) and then writing the number in the equation at the bottom of their addition math mat printable in the first box. Next, students will then build the equation with a small manipulative (cotton balls, white erasers, candies, etc.) to represent the corresponding number rolled on the die in the first half of the glue bottle to show one part of the whole. Repeat these steps for the second half of the glue bottle. Lastly, use a dry erase marker to write the answer to the math equation in the 3rd box located below the glue bottle. Encourage children to count the total number of white glue dots (candies) in both sides of the glue bottle in order to find the answer. 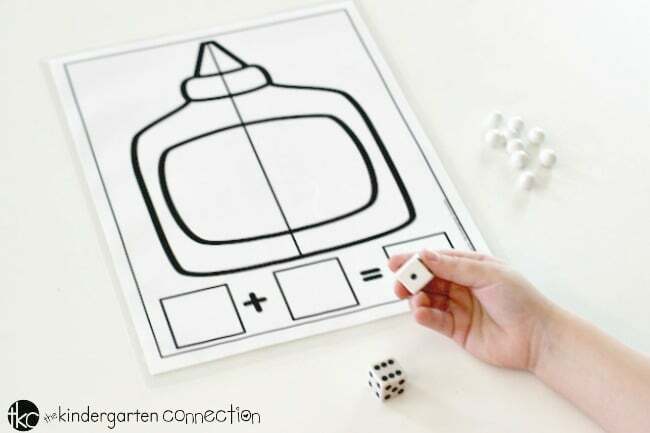 In preparation for using the subtraction math mat, it is important to remind children that this glue bottle doesn’t have two parts because you will be subtracting from the whole glue bottle to find the answer. Begin with rolling one die for the starting point. 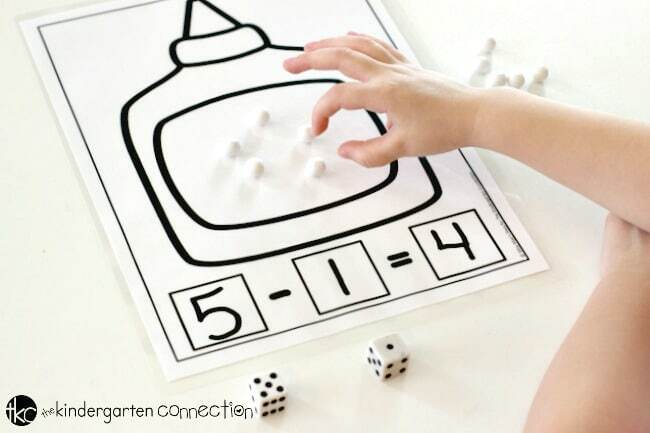 Using a dry erase marker, write the number rolled on the die in the first box below the glue bottle, and then build the number with white candies. Children will then roll a second die to find out how many white candies they will be taking away from their glue bottle and write that number in box #2. Tip: Let students know that they should only roll a number that is smaller than the number in box #1 so that their equation works out properly. If they roll a number larger than box #1, then they should roll again. The next step for completing the subtraction equation is to “take away” white candies from the glue bottle, based on the second number rolled on the die. Lastly, students will count how many white candies are remaining in the center of the glue bottle and then use a dry erase marker to write the answer in the 3rd box. Ready for some back to school math mat fun? Grab your copy of the Back to School Math Mats by clicking the yellow button below! 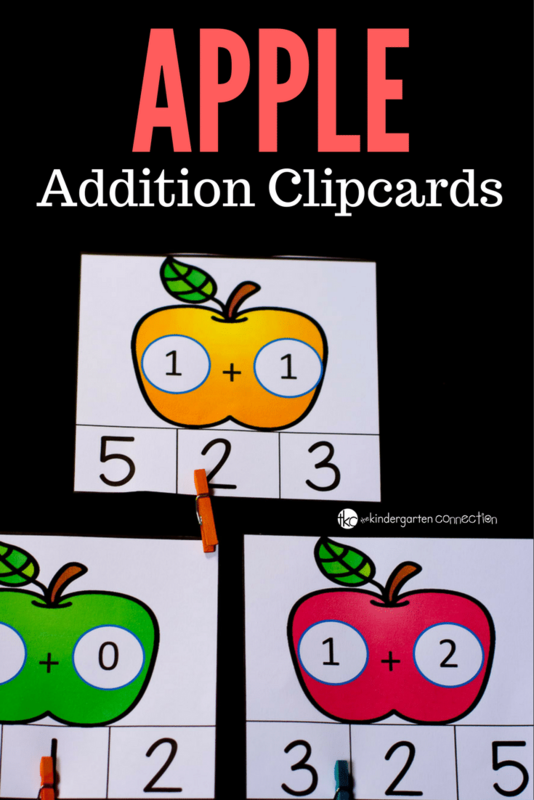 Then hop on over to see our FREE Apple Addition Clip Cards!